My first half marathon is coming up in three days and I’m kind of freaking out because I’m not freaking out. It’s in my DNA to freak out no matter what, but right now, I’m not freaking out. It’s like I’m out of freak or something. 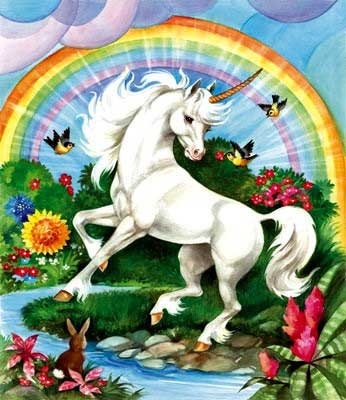 I think deep down inside I’m nervous and anxious and instead of dealing with it like a normal person, I’m ignoring it and going to a strange, happy place in my mind where I am calmed by pretty rainbows and joyful unicorns running around. Maybe I’m not freaking out because I read several books on prepping for a full marathon and since I’m only running a half marathon, I only need to do half as much work as the books recommended. Maybe I’m not freaking out because I totally mastered the “tapering” concept. I think I have taken tapering to a whole new level….a very, very low level. I tapered to a standstill. SCREEEEECH…running (and all exercise for that matter) has ceased to exist this week. At least I won’t have to worry about any pre-half marathon injuries. Maybe I’m not freaking out because I’m not worried about hydrating. Let me tell you, this slow girl can hydrate. I’ve been hydrating all week…just like the book tells you to do. Of course my husband has to ruin it all by saying, “Don’t they mean drink lots of WATER…not WINE?? ?” To that I say, “Whatever hubby.” Chug-a-lug….hello water, here I come. Maybe I’m not freaking out because I have my outfit picked out, my snacks picked out, I’m getting a ride to the race so I know I won’t get lost driving there, my family will be there to cheer me on and I have some super special good luck running socks that my dear friend Kat and her adorable daughter Lily decorated for me. 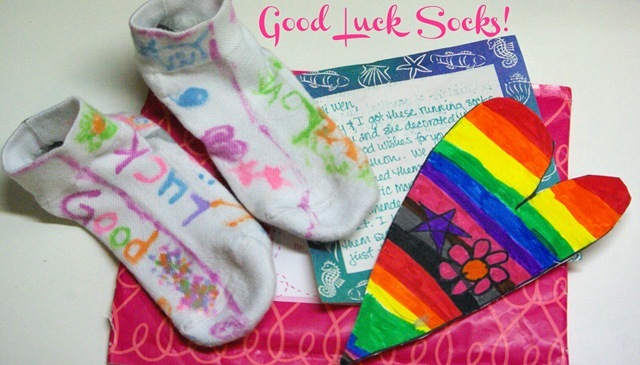 When I opened the package and saw the socks and their well wishes, it brought tears to my eyes (notice I’ve got a rainbow theme going on here with the card below and the unicorn above?). Pure bliss. Maybe I’m not freaking out because this is not a freak out situation. Maybe this is an enjoy the moment, take it all in, relax and run like you’re a joyful unicorn situation. That’s my story and I’m sticking to it. GO Joyful Unicorns. Whoo!!! (Insert dorky Saturday Night Live cheerleader move here). Posted in Uncategorized and tagged half marathon, humor, hydrating, marathon preparation, runner, running, tapering, unicorns. Bookmark the permalink.